Banking on our vast experience in this domain, we are engaged in manufacturing quality assured Temperature Tips. Temperature sensor with long quartz for slag-free applications. Designed for ferrous (S and R) and non-ferrous applications. Foundry use: ladles, pots, runners, pouring spouts, crucibles, small furnaces. Also available with extra ceramic sleeve protection (instead of cardboard tube) for multiple reading applications. Our Temperature Tips give Fast, accurate and reliable molten metal temperature readings during the production. For universal use, interchangeable with hardware from Suyash and other major manufacturers. TemPro gives fast and very accurate temperature readings. Recommended for furnaces and ladles of 1 ton or more, and when particularly reliable and accurate measurements are required. The Temperature Tips With Ceramic Body is used for multiple immersion temp. measurements in molten iron and steel for foundry applications such as ladles, induction furnaces, Crucibles etc. These are designed to facilitate higher productivity reduced downtime as these provide you six to eight application in one probe and thus saves substantially. 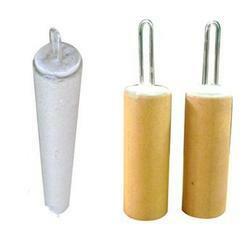 We are the leading manufacturer & supplier of the Temperature Tips. Temperature Tips are the most dependable and quick method to find temperature of molten metal. Relying on our expertise in this domain, we are engaged in offering High Temperature Thermocouple Tip to our respected clients. Pouring temperature can be controlled within close tolerance. Fuel and electricity charges are minimised.